Old Forester 1870 is the first release in Brown-Forman’s “craft” series. We usually don’t think craft when talking about Brown-Forman which is one of the largest American-owned companies in the spirit business but these barrels have been selected the Master Distiller Chris Morris to pay tribute to the company’s history. Old Forester 1870 Original Batch echoes Brown’s original 1870 batching process. Back then, Brown batched barrels obtained from three different distilleries to create a consistent flavor profile. To emulate that process, today Old Forester selects barrels from three different warehouses, with each barrel originating from a different day of production, with a different entry proof and a different age profile. 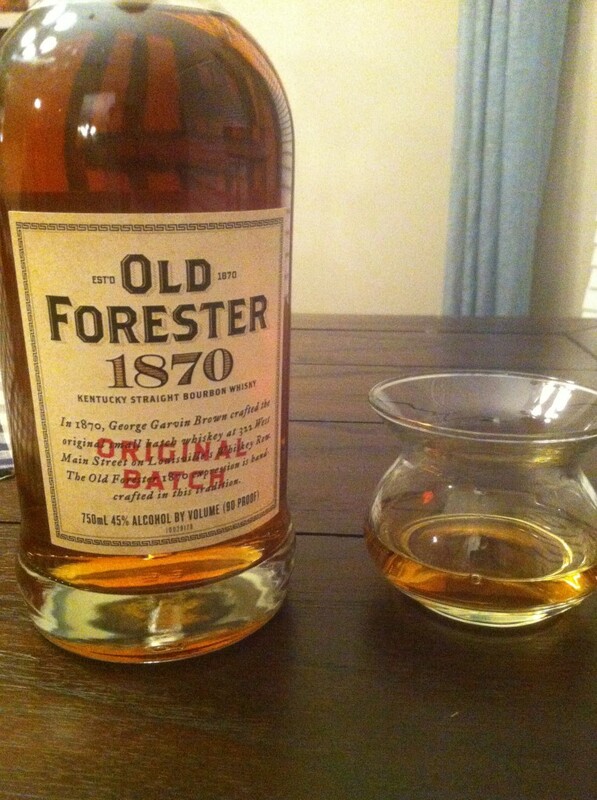 The three expressions of Old Forester are batched together to craft Old Forester 1870 Original Batch. This 90-proof bourbon will be minimally filtered, to honor the processes available to George Garvin Brown at that time. Taste: Starts with a weird cherry cough medicine taste. It’s moderately sweet but more spicy like cinnamon. Overall: I’m not that big of a fan of Old Forester. Sure I’ve bought Old Forester Birthday Bourbon (OFBB) and its always been OK for $40 but nothing close to being worth the secondary market prices. With that being said I think 1870 is a mess. The weird cherry taste completely threw me off. It tastes a little hot for only 90 proof and the flavor seemed out of balance. It improves after sitting for a few minutes but with a $40 price tag it’s an easy pass for me. After writing my review I checked to see what other people were saying about 1870. I seem to be in the minority. Most have rated this pretty high (which I don’t understand). This is just my opinion so maybe it’s me? If you love OFBB you may want to give this one a try. OFBB 14′ KINDA SUCKED FOR ME. Paid $65.00 – Thought is fell really flat compared to the “SIGNATURE” @ 25.00ish — a MUCH better pour. Infinitely more complex (My favorite dessert pour). Won’t be looking for the OFBB in 15′. Won’t bother with this either. Thanks for the review Bub! Wasn’t blown away. it was just interesting to see what it tastes like. Just picked up a bottle for $43 today while buying a liquor store deli sandwich. Will give it a taste tonight, but after reading this review and others I don’t have high hopes. Cough medicine? Agreed. Wish I had passed. This is another example that shows there should be more blind tastings among blogs and other whiskey writers. In the bourbon world we’re are all so focused on brands they create biases that our taste buds will not overcome. Blake opens his overall opinion stating he doesn’t like Old Forester… We can claim it doesn’t color our perception, but the unconscious bias rules all. My question is, is this basically Woodford Reserve? Same mashbill, same proof, supposedly from the OF’s honey barrels. I’ve got to try them next to each other. I liked it…. What more can one say? Still do. I’ll repeat what I stated in an earlier post: this, for me, is a fine whiskey. I’m drinking one now. It’s the glory of bourbon: preferred tastes, others around the corner to try. I got mine at Costco for $35. Had to try it. Yes, I was a little disappointed but I guess it’s history. It reminded me of Jim Beam single barrel.